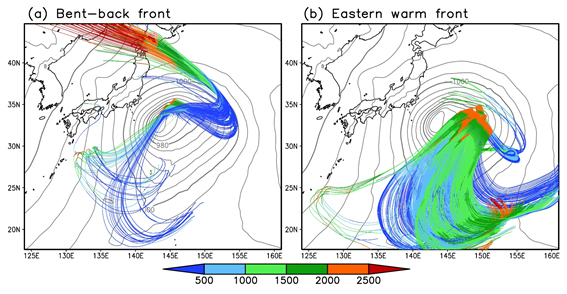 This study has focused on an explosive cyclone migrating along the southern periphery of the Kuroshio Current/Kuroshio Extension in the middle of January 2013 and examined how those warm currents played an active role in the rapid development of the cyclone using a high-resolution coupled atmosphere-ocean regional model. The evolutions of surface fronts of the simulated cyclone resemble the Shapiro-Keyser model. At the time of the maximum deepening rate, strong mesoscale diabatic heating areas appear over the bent-back front and the warm front east of the cyclone. Diabatic heating over the bent-back front and the eastern warm front are mainly induced by the condensation of moisture imported by the cold conveyor belt (CCB) and the warm conveyor belt (WCB), respectively. The dry air parcels transported by the CCB can receive large amounts of moisture from the warm currents, whereas the very humid air parcels transported by the WCB can hardly be modified by those currents. The well-organized nature of the CCB plays a key role not only in enhancing surface evaporation from the warm currents but also in importing the evaporated vapor into the bent-back front. The imported vapor converges at the bent-back front, leading to latent heat release. The latent heating facilitates the development of cyclone, through the production of positive potential vorticity in the lower troposphere. Its deepening can, in turn, reinforce the CCB. In the presence of a favorable synoptic scale environment, such a positive feedback process can lead to the rapid intensification of a cyclone over warm currents. Fig. 8. Trajectories of the air parcels that are initially located to the (a) west and (b) east of 146°E, which are calculated by a backward trajectory analysis. The color lines denote the heights (unit: m) of the air parcels. See text for details. The SLP distribution at 1500 UTC 14 Jan 2013 is also represented. The contoured interval is 4 hPa.